Wood-graining.....faux finish technique used to create domestic and exotic wood species. Graining, is often used in many designs, inlays, creating medallions, and crest. It also can be used to simulated parquetry & marquetry designs on furniture or on a wood floor. Inlay is the art of placing various flooring and other materials of nature into a floor to form borders or patterns or designs. 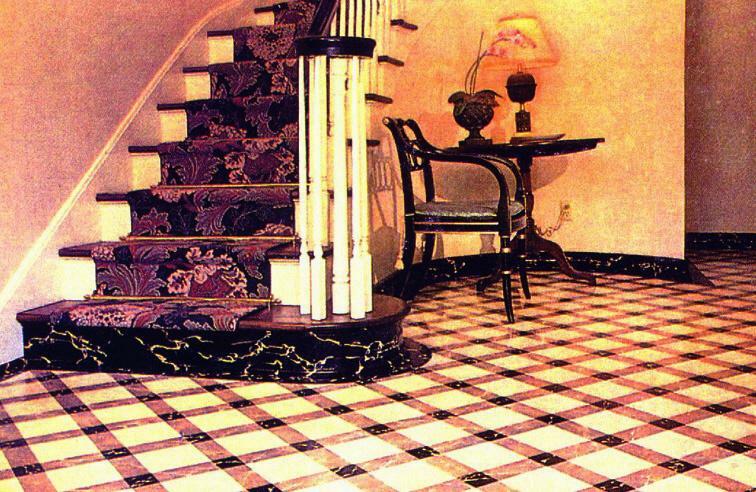 Faux inlay is the creation and reproduction of those materials normally used in floor inlay ie: marble, stone, woodgraining, or just simple colors, all to form patterns and designs, all hand painted to fool the eye. This includes variations of marquetry & parquetry both of which are forms of arranging wood pieces and strips into a geometric pattern and/or design. The products of nature that are usually used include tortoise shell, ivory, mother of pearl, bone, brass, gold & other materials suitable for floor installation, All of which can be faux painted to simulate the real material. Thus a custom one-of-a kind, design & pattern can be achieved using various exotic wood grains, marbles, inlay pattern designs. 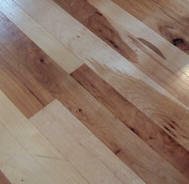 The floor is then protected with several coats of a urethane floor finish.